lubelfing : swimming and canoes, west africa, 1600. Johann von Lubelfing : Swimming and Canoes, West Africa, 1600. Voyage of 1599 to 1600. Johann Zachariae Fleissner, UIm, 1612. As an example of their ability to "swim below the water like a fish," Lubelfing relates how one African jumped overboard with a pewter tankard and a soldier's helmet, swam a great distance underwater; and absconded with a companion in a canoe. Lubelfing makes two reports of Africans approaching the ship at sea to trade ivory and peper. These were in small two-man dugout canoes, in one instance at a considerabe distance off-shore, "so far out that we could no longer see the land." Lubelfing (or Leublfing) served as a lance-corporal in a Dutch fleet under Pieter van der Doesto which set out to capture the Portuguese held island of Sao Tome off the Arican coast, in May 1599. Although the island was captured and two forts were destroyed, the mission was largely a failure with cost of several thousand lives and the loss of Sao Tome's plunder on the return home. The sack of San Tome is expertly examined by S. P. l'Honore Naber (in De Marees 1912) and there are two contemporary pamphlets (Van Heede 1599; De Jonghe 1600) and a further secondary study (Abendanon 1921). Lubelfing was of noble birth and lived at the court of Count Philip of Hohenlohe, in Buer (north of Essen), before joining the fleet in Vlissingen in April 1599. Returning in February 1600, he acquired the title of chief lieutenant of the Hansa League, and later settled in Gansheim, a village in Franconia. The account of the voyage was published in UIm in 1612 by Johann Zachariae Fleissner of Pullenreith, a clerk. Fleissner's preface implied that, at this time, either Lubelfing was dead or the manuscript had passed out of his hands. Originally written in the form of a journal; it was probably rewritten after the voyage, with several references to later events. It is an exceedingly rare book, probably suggesting that very few copies were printed. - collated from Jones' Introduction (1983), pages 9 and 10. 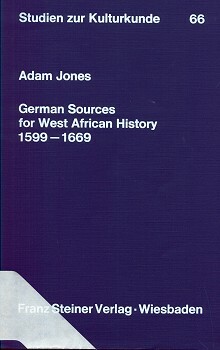 Note that the book is unpaginated, and Adam Jones, the editor of the 1983 translation, has inserted his own page numbers, counting the foreword ('An Leser') as page 1. "It is long-winded, often scarcely comprehensible, and contains only a limited amount of ethnographic information about the places he visited." On 13 July we drew near the Island of S. Nicolau [one of the Cape Verde Islands]. Some of our ships sent many people ashore in shallops and boats to seek fresh water, which they found there and bro~t aboard. But there was not [p. 18] much to be obtained and we could not cater for our armada. Towards evening we found that in sailing we had lost more ground than we had gained, on account of the contrary wind; and so we cast anchor very close to the aforementioned country, in 14 fathoms, near a large river which runs into the sea there, called Alchester [? Sestos]. but full of trees and bushes. It is inhabited by the Moors, who run around there in a savage state, without clothing. They do not take the trouble to work, either: they live on the fruits of the country and on their livestock. [p. 27] On 6 September ... two Moors came to our ship in a tiny little boat, consisting merely of a tree-trunk, [?] pointed at both ends and about 2 spans wide, so that they had just enough room to sit inside on their knees. Each man had in his hand a small, very short paddle, broad at the bottom. With this they rowed so swiftly that we soon lost sight of them. Inside the little boat each man had his weapons - a small spear, a bow and arrows. One would not have thought it possible to travel on the sea in such a tiny boat (which I could easily carry in my hands); [yet] they came so far out to us that we could no longer see the land. They brought with them ivory and in return desired brass basins (whose name they knew), as well as wine and bread; but they did not want to come aboard our ships. On 7 September ... we got past the promontory and in the whole day sailed about 8 miles southeastwards. Three little boats with two Moors in each came to our ship. These boats were cut from a single piece of wood, each being of the same size and shape. [Footnote] 5. For other descriptions of the small canoes used on the Grain Coast, see Pereira 1956 liv. 2, cap. 3: 104; De Marees 1602: 6v; Ruiters 1913: 302; Villault 1669: 86; Barbot 1732: 128 pl. F.
The baskets in which pepper was sold gave the river its name (Port. cestos 'baskets, hampers'): Pereira 1956 liv. 2, cap. 2: 102. [p. 28] A sailor or skipper blew a trumpet, which pleased them so much that they gave two tusks in exchange for the trumpet. They ate and drank on our ship, but did not want to go below deck. They can swim below the water like a fish, as they proved there. One of them, who had a pewter tankard of beer in his hand and a soldier's helmet on his head, jumped into the water with them and swam thus a great distance underwater; then he re-emerged and jumped into his little boat, which his companion had to bring to him. [Footnote] 6. Cf. Hemmersarn 1663: 17. Geoff Cater (2013) : Johann von Lubelfing : Swimming and Canoes, West Africa, 1600.